Six audio recordings of these Haptic Encounters can be accessed in the gallery at select listening stations. Georgina Kleege, professor in the English and Disability Studies departments at UC Berkeley has been a leading scholar on the intersections between blindness, visual art and has expanded the field of audio description through her practice. She has lectured and served as consultant to art institutions around the world including the Metropolitan Museum of Art in New York and the Tate Modern in London. Kleege’s latest book, More than Meets the Eye: What Blindness Brings to Art, (forthcoming in 2017) is concerned with blindness and visual art: how blindness is represented in art, how blindness affects the lives of visual artists, how museums can make visual art accessible to people who are blind and visually impaired. Image description: Close up of Georgina Kleege smiling widely to the camera, pictured from the shoulders up. The top of her white cane appears in the image, appearing that she is holding it with her left hand. Georgina has short white hair that reaches just beneath her ears, and she is wearing a moss-green linen cardigan and a black shirt. In the background is a section of the introductory wall graphic for the exhibition, which is a mint green color. In order to provide greater accessibility for all of our visitors, all wall text and artist labels are provided in braille and large print booklets located at a dispenser at the entrance of the gallery. Transcripts of all audio material from listening stations is also available, in addition to a tactile gallery map developed in partnership with Lighthouse for the Blind and Visually Impaired. Image description: Georgina Kleege’s right hand explores the textured glass and mirrors inside of a tree-like sculpture in Andy Diaz Hope & Laurel Roth Hope’s work of art The Woulds. Magenta, yellow, and green light projections radiate out from the tree opening, casting a soft light on Kleege’s hand. A small ceramic white bird sits atop the tree trunk. Andy Diaz Hope & Lauren Roth Hope, The Woulds, 2017. Wood, ceramics, glass, mirror, video, motors, and paint. Photo by Gary Sexton Photography. I am the blind daughter of two visual artists. I grew up surrounded by their work as well as the tools and materials they used to make it. Since childhood, whenever I’ve been given the opportunity to touch a work of art, either in the artist’s studio, or on official touch tours for the blind at museums around the world, I leap at the chance. Over the years I have observed that sighted people—my friends and even strangers who watch me doing this in museums—really want to know what it’s like to touch works of art. Since everyone does not enjoy this privilege, I have come to feel that I have a responsibility to share my experiences with others. In 2016, this led me to collaborate with Australia-based artist, Fayen D’Evie, on a project at KADIST, a private art foundation in San Francisco, to develop techniques and vocabulary to describe haptic and tactile explorations of art. Now, it brings me to The Contemporary Jewish Museum, to offer some observations from my haptic explorations of six works of art in the exhibition, Jewish Folktales Retold: The Artist as Maggid. What I gain from haptic and tactile explorations of a work of art has less to do with imagining what it looks like, and more to do with an appreciation of qualities such as texture, temperature, weight, resiliency, and density that may not be apparent to the eyes alone. I have learned that different works of art invite and reward different types of touching. Some pieces require a delicate tracing motion with the fingertips while others encourage a more energetic grasping or manipulation with the whole hand. I feel my hands follow the motions of the artists’ hands and often discover unexpected features of their process and craft. I do not believe that my sense of touch is any more sensitive than a sighted person’s. In fact, it is a myth that blind people are gifted with some kind of super sensitive tactile perception. This kind of belief mystifies and exoticizes blind experience and can contribute to the social ostracism of blind people, putting us in the category of the other-worldly. Moreover, most blind people do not have much experience touching works of art. Even those who have taken advantage of traditional museum touch tours may have only a cursory experience. There are sighted people who enjoy the privilege of touching works of art—art conservators, exhibit installers, not to mention the artists themselves—and my observations may be more in line with theirs. In other words, what I have to offer has less to do with my blindness and more to do with the privilege I have enjoyed in touching art over my lifetime, and my deliberate effort to develop a system of haptic exploration and interpretation. In addition to my background and experience of touching art, I bring something else to the Jewish Folktales Retold exhibit. I am also a writer, an English professor, and a teacher of creative writing. I know something about how stories are made and how readers interpret them. All the works of art in this exhibit are inspired by stories. The artists have latched onto certain features of the story, a narrative detail, a significant object or setting and brought that to the fore in their interpretations. As I have explored these works haptically, I compare the artists’ interpretations of the stories with my own. At the same time, I am also seeking the aesthetic pleasure that comes from touch. The point is not merely to identify objects and figures and link them to the corresponding elements in the stories. Just as the point of looking at art is not merely to identify what’s being depicted, but rather to respond to the effects of composition, color, and form that produce a sense of harmony, or discord, mystery or revelation and an infinite number of other emotions in the viewer. Similarly, as I explore these works of art through touch I try to be receptive to the qualities of the chosen media, and draw meaning from the forms and spatial arrangements. There are surprises when the shape of an object resembles something in nature but the material is radically at odds with what it represents. For example, in Michael Arcega’s sculpture inspired by the story, “The Enchanted Island,” the fruit on the table is cast from silicone and so duplicates the shape and surface texture of actual fruit, but the feel of the fruit in my hand is unexpectedly squishy, something like a half-filled water balloon. It both feels like fruit while it simultaneously feels like nothing found in nature. I think this corresponds with the visual appearance where the natural forms are made supernatural by their ghostly translucence and the glowing lights inside them. This discordance between the natural and the supernatural coincides with a central feature of the story: the uncertainty, at least until the end of the story, about whether Wolf Kitzes is dreaming, hallucinating, or actually visiting the enchanted island. Image description: Georgina Kleege reaches her right arm forward towards a floating table sculpture made out of dark grain wood hanging over the main Museum staircase. Two legs of the table are visible as well as an assortment of objects spread on the table, beginning with an abstracted wooden shofar (ram’s horn), followed by a translucent vellum grocery bag with silicone fruit spilling out of it, suggesting a cornucopia. On the other side of the wall where Kleege reaches over, appears a sturdy wooden hull of a boat arching down towards the floor. Michael Arcega, The Enchanted, 2017. Wood, silicone, vellum, lights, and other mixed media. Photo by Gary Sexton Photography. Haptic exploration of Julia Goodman’s hanging installation inspired by the final scene in “The Bird of Happiness” reveals the contrasting qualities of the two sides of the hand-made paper panels. The richly diverse textures on one side contrast with the billows and tufts of the other, where the shreds of old bedsheets and t-shirts are not completely incorporated into the paper. Like the king in the story, the sighted viewer—and the haptic explorer—are reminded of the humble origins of both the material and the man. Image description: Georgina Kleege stands inside of a handmade paper sculpture made by artist Julia Goodman. In the image we see one part of the sculpture that is composed of 9 hanging paper panels made of repurposed rags, old t-shirts and bed sheets. Each hanging layer of paper starting from larger to smaller, has holes in the middle of them allowing Kleege to lunge her body forward and extend her arm into the sculpture. In her left hand she holds a white cane. She appears to be smiling and enjoying the immersive moment of having her body exploring the inside of the sculpture while delicately touching one of the paper panels. Julia Goodman, 200 Year Present, 2017. Discarded and pulped bed sheets and t-shirts. Photo by Gary Sexton Photography. The sharp, almost splintery texture of the trees in the installation by Andy Diaz Hope and Laurel Roth Hope enhances the idea in several of these folktales, that the natural world is not as benign as humans sometimes imagine. Image description: Georgina Kleege is pictured from the waist up reaching with both arms to touch a silver colored tree-like sculpture made of wood, suggesting a forest. There are geometric shaped branches shooting out from the central trunk, and a small ceramic white bird sitting atop a branch at Kleege’s eye level. In the background are geometric light projections and a series of hanging glass diamond-shaped sculptures suspended in the space. This is also palpable in David Kasprzak’s interpretation of “The Golden Mountain,” where the persistent, buzzing vibration inside the shell suggests the mysteries of alternant modes of communication. Image description: Georgina Kleege is pictured with her right hand delicately touching a syrinx aruanus shell created by artist David Kasprzak. The shell appears to be floating in the foreground of the image. Kleege holds a white cane in her left hand. A spotlight shines from above illuminating the top of Kleege’s head and the shell. Kleege’s facial expression is concentrated with a slight smile expressing the pleasure of touching the shell. David Kasprzak, The Dimishing, But Never Final, Sounds of the Dying, 2017. Syrinx aruanus shell, steel, media player, sonic transducer, looped sound. Photo by Gary Sexton Photography. In addition to the discoveries and pleasures of direct contact with the works of art, there is much to be gained from other nonvisual senses. Monumental sculptural works can cast shadows and alter the air temperature in their vicinity or reroute the air flow around them. For example, Mike Rothfeld’s sculpture occupies space and looms overhead in a way that can be apprehended non-visually. These qualities are activated as the sighted viewer, or the unsighted beholder, moves around and through it. This reinforces the sense of the powerful, transformative effect of the portal featured in so many of these stories. Image description: Georgina Kleege stands with her left hand exploring the textured surface of the front of Mike Rothfeld’s cave-portal sculpture, holding her white cane in her right hand. The sculpture is made of polystyrene and mixed-media, and is suggestive of a cave that visitors can enter and walk through with their whole bodies. The color of the cave-portal is an iridescent combination of blues, purples, and greens, and has a magical quality to it. In the left background appear two large-scale sculptures suggesting animals or monsters. Mike Rothfeld, It is tomorrow we bury here today, 2017. EPS and polyurethane foams, and other related materials. Photo by Gary Sexton Photography. Similarly, in Elisabeth Higgins O’Connor’s installation, the large size and dynamic poses of the two figures convey their power, but here the brittle and fluttery textures of the many layers of materials that went into their construction convey their impermanence. Like the Golem in the story, it feels like they could easily disintegrate and return to the random elements from which they were assembled. 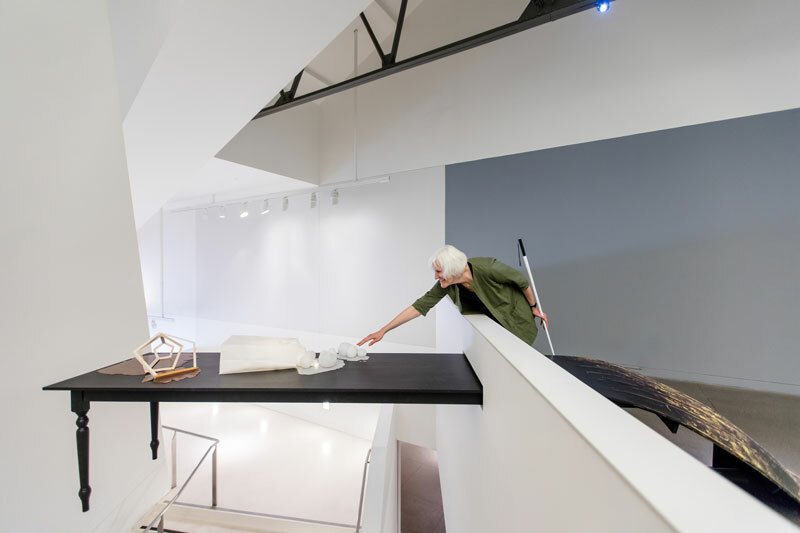 Image description: Georgina Kleege stands in front of artist Elisabeth Higgins O’Connor’s large-scale sculpture creature with her right hand immersed inside of its mouth, and her left hand holding her white cane. The sculpture which looms above Kleege references the Golem creature in Jewish folklore. The sculpture is made out of Styrofoam, pink paint, lace, flowery textiles, string and twine. The creature appears to be a bull and its right arm is lunging back as if it were about to throw or lunge at something. Elisabeth Higgins O’Connor, lullaby/lament, 2017. Lumber, Styrofoam, paint, bedsheets, lace curtains, lace tablecloths, domestic textiles, paper, cardboard, quilting pins, string, twine. Photo by Gary Sexton Photography. I am very happy to have this opportunity to lend my hand to the appreciation of this exhibit. I am grateful to The Contemporary Jewish Museum, for allowing me to do something which, to my knowledge, has never been attempted in any museum anywhere in the world. I hope that other museums will follow the example of The CJM, and seek to include the voices, experience and expertise of communities that are typically excluded from art museums. In particular, I thank Cecile Puretz, Access and Community Engagement Manager at The CJM, for having the courage and imagination to facilitate this project. And I appreciate all the artists for putting their works of art in my hands.